All of the connectors below are two-pole and have some sort of polarization system to ensure correct mating. This pattern of connector is common in the Radio-Controlled (mainly airborne) model field. Frequently called “JST”, or “BEC” (Battery eliminator circuit) they are a two-part, two-pole, 2.5mm pitch connector with crimped pins. 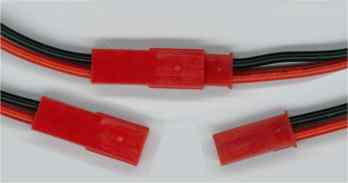 The connector housing is invariably red in colour, although these are also available in white. The manufacturers of this connector is JST (Japanese Solderless Terminals), and these connectors are part of their RCY series. Please see product web page or pdf data sheet for full details. This is rated at 3A at up to 250V over the temperature range -25°C to +85°C. The terminals can accept stranded wire from 0.08 to 0.33mm2 (28 to 22AWG). The pole marked “1” is normally -Ve (black), and “2” is +Ve (red). Considering the ubiquitousness of this connector, they are surprising difficult to obtain in sensible quantities in the UK. There are several vendors on eBay that offer ready-made cable assemblies with flying leads. The JST-UK online shop will sell you pins in multiples of 8,500 and housings in batches of 1,000! If you feel lucky you may be able to blag free samples from their sample page. A UK company called “Model Power” are offering these connectors in multiples of five for about £2.65 a set. The female connector (that they call a “plug”) is listed here with the mating male half (that they call a “socket”) here. Model Power also stock the appropriate crimp tool - a snip at £16.95 a go. Mini (1.25mm pitch) Molex connectors from Rapid: They say you can crimp them using the crimping tool they sell. This is totally wrong. Instead, strip a short length of wire, solder to the crimp terminal, then bend the ends of the outer crimp over so it will insert into the housing. The open side of the crimp terminal goes with the closed side of the housing. It is still extremely annoying, I don't recommend these connectors.